A view of the mountains in the mist. I’ve taken a new approach to my time in Seoul. I’ve promised myself to see at least one new thing each week. It doesn’t have to be anything extraordinary, just something I haven’t seen before. This past weekend, I made a trip to Seoraksan National Park, located on the east coast of Korea and regarded as one of the country’s most popular sights. 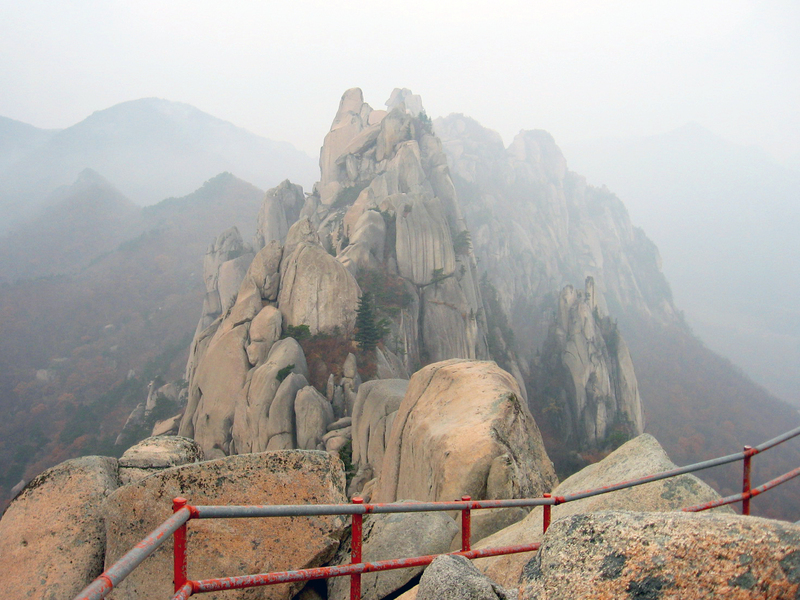 I’ve been hiking two other times in Korea, and my experience in Seoraksan completely eclipsed those. After our four-hour bus ride from Seoul, we stayed in a traditional Korean house in Sokcho, the coastal town only 10 minutes from the national park. The area was filled with traditional motels like ours, in which we slept on mats on the heated floors. It was actually very efficient; even in close-to-freezing overnight temperatures, I was sweating in my sleep. The staircase of near death. This is a lot of stairs to get to the top. The rain that fell as we approached the metal staircase didn’t help matters, either. After some moans and groans and a lot of trudging, we finally made it to the top — and our efforts were completely rewarded. Despite the cloudy skies and walking two hours in unfortunate weather, the view was amazing. Falling off Ulsanbawi would not have been pleasant. Looking from there, however, was quite nice. We had lunch and did the usual foreigner/tourist things (read: take an endless amount of photos) before zooming back down the mountain (read: avoiding death on the stairs). Walking a couple hours and miles in the rain only called for one thing: a trip to a Korean sauna, called a 찜질방 (pronounced “jim-jil-bang”). These places are more than just saunas: along with saunas, they have dry rooms, spas, and cold pools along with many other relaxing services. This was my first 찜질방 experience, and it was nice. The problem, however, was that there five guys and five girls. The guys were done with the place in less than an hour; the girls not surprisingly took their time and fully enjoyed all the place had to offer. We guys then sat around and talked about who-knows-what for an hour before we could head off to the fish market for dinner. There we found what seemed to be everything that could be taken from the east coast of Korea. Restaurants upon restaurants displayed their menus in aquariums in front of their buildings while smaller ventures — restaurants set up under tents — had smaller tanks in which they usually separated their servings by baskets. 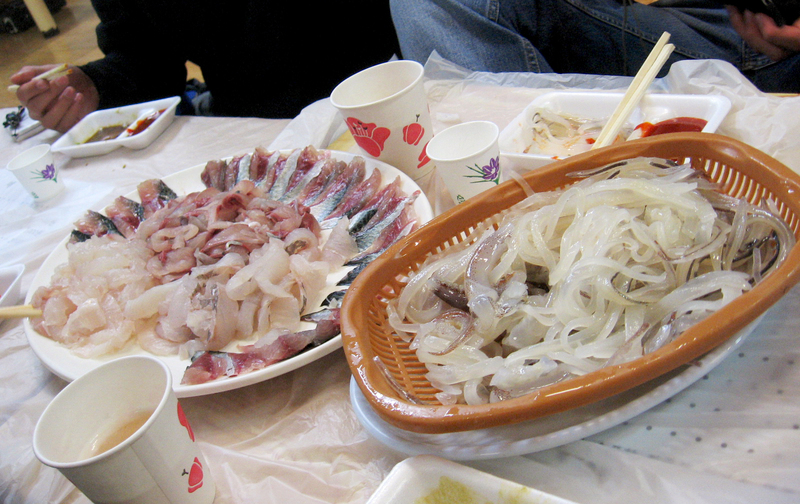 After stopping in a tent for two plates of various and delicious shellfish, we moved on to another that offered us a basket of good-sized fish and two-squid for 40,000 won. With five of us in tow, we figured that 8,000 won a head was a bargain for this much food. Little did we know, however, that the only difference between the fish being sold to us and the fish we would eat was the way it looked. We were brought one large plate of diced fish and a large basket of sliced squid — none of which was cooked. We saw this fish and squid when it was still alive. We had our share of the fresh fish, but enough was enough. We bought the boiling soup to cook the rest of our dinner and called it good. Two plates of shellfish and an excessive amount of raw fish (along with the requisite beers and soju) only cost each of us 22,000 won for the night. We’ll chalk that night up as a success. The next morning, we walked around the park for a little while before taking the cable car up to one of the higher and more dangerous peaks. After getting up to the top, there was still a little more to climb to really see everything. 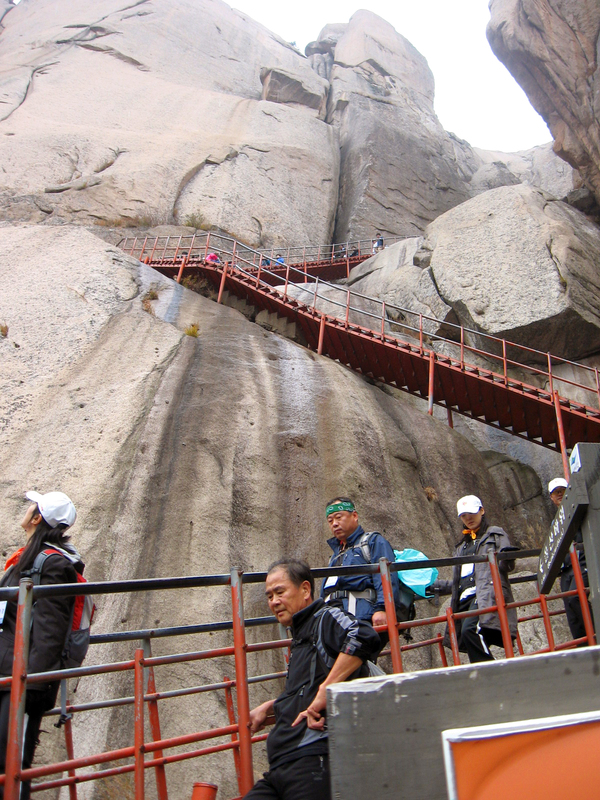 After fighting off old Korean men and women to get up to the top, we had to fight off old Korean men and women to get back down, which really isn’t much fun considering the steep and tricky decent. It's scary how pushy these people can get, even on a steep rock face. 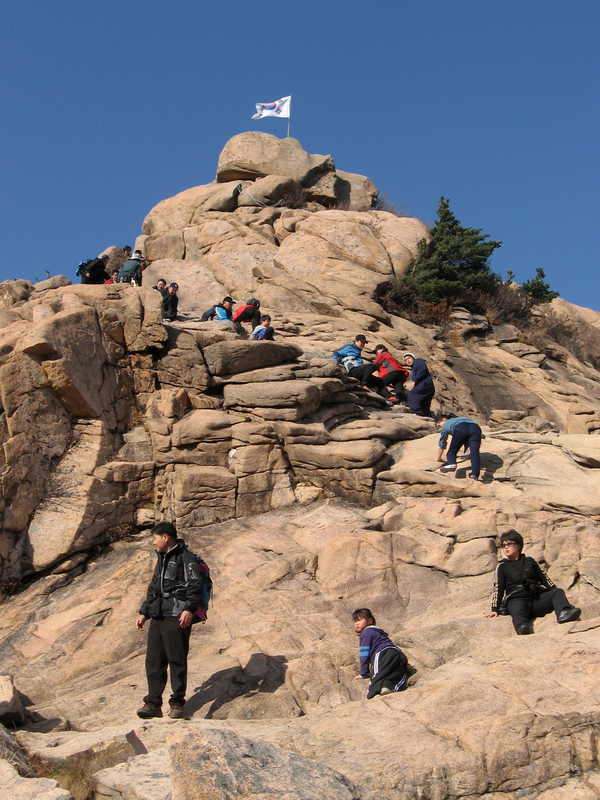 Fitting that climbing to that peak was the last event of my first weekend out of Seoul. The clean air and fresh food really set the mood right. 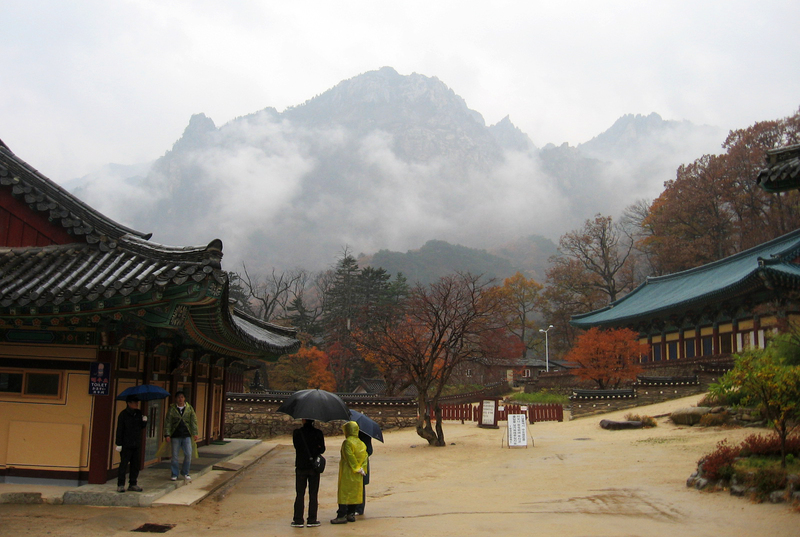 I’m sure I’ll be back to Seorak-san at some point — probably after I run out of new things to see.